This organic tea was grown at very high altitudes in the Mim Darjeeling region of Northern India. Because the tea is grown at high altitudes of over 6800 feet above sea level and in relatively cool weather the bushes do not grow quickly, and as such the production is limited. The best time of the year for quality is during ‘second-flush’ (May - June). 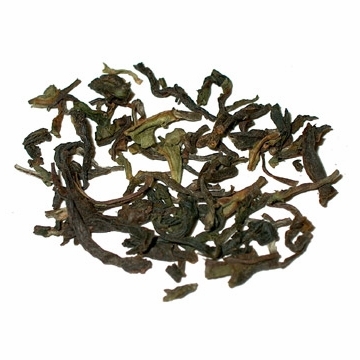 This organic Darjeeling black tea is classified as TGFOP (Tippy Golden Flowery Orange Pekoe). Due to the superb taste and limited production of Darjeelings, these teas are quite rare. This tea was thoroughly scrutinized to ensure the highest of quality. This Darjeeling has a bold flavor and the fragrance of muscatel grapes. Many people consider the Darjeeling to be the champagne of tea. Free shipping with purchase over $60. A lovely darjeeling . . .
Love darjeeling, and this rich, aromatic tea is no disappointment. And organic to boot! A pure, full flavor with no astringency or bitterness. I highly recommend it if you like darjeelings. There is a reason they call Darjeeling the Champagne of tea, good! Price is wonderful too. Excellent blend - I prefer a strong brew. Darjeeling can be brewed strong without it becoming overwhelming. A very bold flavor with a fragrance of muscatel grapes. It is a champagne tea with a mild flavor. Great with milk and sugar. Darjeeling is a great black tea, and the organic is better than the regular. I highly recommend it. Very good darjeeling. The flavor is really good. Nice tea for morning or afternoon. I am not a tea expert, just an ordinary tea drinker, judging what tastes good to me. There are better and more flavorful darjeelings available in the marketplace of teas. That said, this tea represents a good value and produces a very drinkable cup. It is reasonably priced and is a good deal. I give it four stars for taste, five stars for value, and four stars combined.